Palm Springs might not be the first Californian destination that springs to mind for a family vacation. If you”™re looking for somewhere a bit different to Disneyland, Legoland and San Diego to enjoy in the Golden State, Palm Springs may be ideal. There are plenty of outdoor activities for children to burn off excess energy. There”™s heaps of cool stuff to do indoors and escape from the heat. Indeed, there are many things to do in Palm Springs with kids. And, there are lots of things to do to keep mom and dad happy too; it”™s not JUST about the younger members of the family! There are few kids, and adults too for that matter, that can resist the lure of a water park on a hot day. Providing fun the whole family, Wet ”˜n”™ Wild (formerly known as Soak City) is one of the top things to do in Palm Springs with kids. From small slides for little kids to thrilling slides that will give teenagers and adults a good adrenaline boost, there are slides and chutes for people of all ages. The tube slide is often a hit with middle-school-aged children. The lazy river is great for some chilled-out family bonding and the wave pool is sure to raise a giggle or two. There”™s a four-level house filled with watery fun too. Try surfing in the desert, with FlowRider. Chill out in a cabana while the kids have fun or get wet and go wild too! You”™ll find even more watery fun at Palm Desert Aquatic Center. Children can splash around in the fun water playground while adults practice their breaststroke and diving skills. And, who can resist the tall water slides? Great for animal lovers of all ages, The Living Desert Zoo and Gardens is a combined zoo and botanic garden. It aims to teach people more about the flora and fauna of the desert. There are creatures that call the deserts of North America and Africa home. Animals that live in the well-maintained zoo include coyotes, bobcats, cattle, zebras, cheetahs, leopard, and giraffes, as well as diverse lizard and bird species. Many people enjoy having the colorful butterflies flit all around them at Butterflies! Winged Wonders. There are several walking trails through desert terrain for a more immersive experience; take plenty of water! The model train and carousel often delight children. Other highlights include educational talks with keepers and nighttime walks. Everyone can admire the sweeping desert views with a ride on the Palm Springs Aerial Tramway. It carries visitors more than 8,000 feet up San Jacinto Mountain. There is an interesting interpretive center and, if your children are feeling energetic, there are a number of walking trails to explore. You can head to the top of the 1,000-foot mountain for more fabulous views. The cooler temperatures are great for escaping the summer heat, and the mountain often sees snow in the winter months. Even though the Children”™s Discovery Museum of the Desert (CDMOD) is aimed specifically at kids, there are still likely to be some eye-opening moments for the adults too. The interactive museum is perhaps better suited to younger children, though. Your children can take part in art activities and get active on the climbing wall, and there”™s a separate section especially for toddlers. One of the quirkiest things to do in Palm Springs with kids is to go and see the Cabazon Dinosaurs. Two gigantic dinosaur statues tower over the side of the road. Make sure to take the camera because you”™re likely to want to snap some cool pictures of your children with the statues. If your children are fascinated by planes, a visit to Palm Springs Air Museum is a must. There are many historic planes within the museum and visitors can learn more about the roles of the planes and their crew during the Second World War. Your kids can clamber inside some of the planes and teenagers may enjoy the flight simulator. Younger children can have fun as they learn at the education area. If your family likes spending time in the great outdoors while on vacation, walking through the Indian Canyons can be a great way to spend a day. Other terrific things to do in Palm Springs with kids include ice skating at Desert Ice Castle, heading off road for a bumpy exploration of nearby national parks and the San Andreas Fault and discovering the area by horseback. Budding artists might enjoy a visit to Palm Springs Art Museum. The large Marilyn Monroe statue in downtown makes for some great photo opportunities, even if your kids don”™t know who she is; they”™re sure to giggle at the lady with her dress blowing up! Make your family vacation run smoothly when you stay in one of the family-friendly Palm Springs vacation rentals. Whether you”™d love the option to prepare your kids”™ favorite meals with self-catering facilities, relish the idea of spending lazy days by an onsite pool or want lots of space for your children to run and play, you”™re sure to find something perfect from the wide selection of accommodation options. Stay somewhere with a few bedrooms and you can even take the grandparents along to babysit while the parents hit the golf courses or casinos! 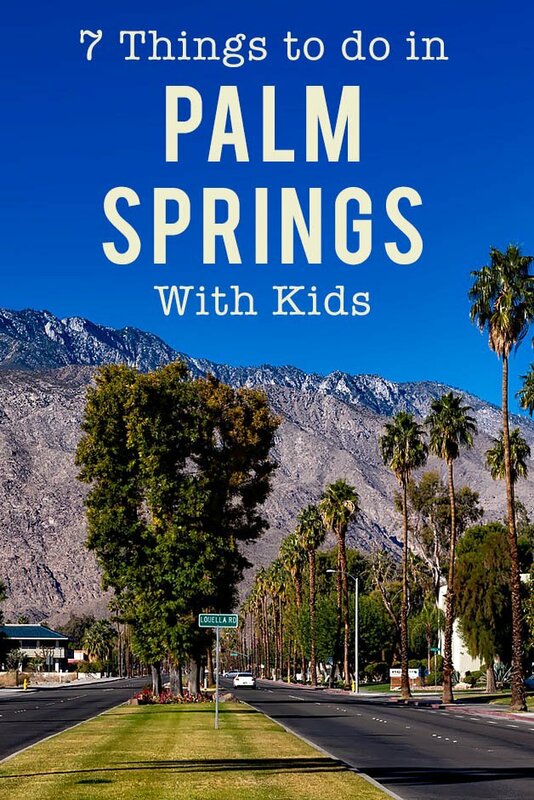 There are many reasons to visit Palm Springs with the kids! Have you been? What was your favourite activity? Looking for More California Content? Thanks for sharing the Palm Springs tips…saving this for a future trip! Our trip is not finalised yet but we may be in the area this summer and this is giving me loads of ideas: I think the water park would be a majour hit with my two kids!